RIP God! Wish You were not killed by those loudspeakers! The day had started on a brilliant note. It was unfolding like those perfect Sunday mornings which effortlessly stretch themselves into the late afternoons. It was forcing itself, albeit quite beautifully, upon me by making me ponder over one of the most important questions of bachelorhood that has stretched itself into the early thirties of a not so eventful life. The question, too, did not have much to do with any metaphysical quests or the complexities of modern life. Rather, it was quite a simple and rather endearing one- if I should get off the bed to make some tea for myself or if I still had some time left to lazily stare into the white nothingness of the ceiling. Then, some people somewhere in the vicinity took the burden of snatching me out of the unproductive slumber unto themselves. And what better way could they have found to ensure that than by unleashing the gods themselves on these lazy limbs wasting the Sunday morning? So they did by switching on what seemed and sounded like a thousand loud speakers blaring religious songs into my hapless ears. This was it for that idle gaze fixed on the roof, that pondering over making tea and all that made a Sunday morning beautiful. What I did not understand, though, was how these people got to know that on the question of god I concurred with that wreck of a person called Friedrich Nietzsche. If only he was around, he would have known how wrong he was. The god was yet not dead, just that he had come to live in my neighbourhood. This one was an intrusive one on top of that who has entered my house riding on the sound waves produced by the loud speakers. This was not the first time though when the god has come to grace the neighbourhood I have been living in. Quite on the contrary, and despite all the problems I started having with him since my late adolescence, he has always been there. I have grown up with him for he was an integral and inalienable part of popular culture. He was there in the prayers of my parents every single morning. He would come to our mohalla every other day, whenever anyone had any reason to feel happy and declare that to the world at large. There would be Satyanarayana Kathas (tales of a true god). I always wondered about for they told all the tragedies that struck the people who were supposed to listen to the ‘katha’ but forgot. They would tell the tales of how this misfortune went away when they rectified their ‘sin’ and organized the recital of the ‘katha’. Yet, there was no tale in the katha and no one in the mofussil who could tell me what the real tale was about! This, again, does not mean that I had anything against him during those heady days of growing up. I would definitely ponder about the actual tale that was missing from this katha but would love the prasad, especially the sugary flour we would get after the pujas. Then there would be those fairs (mela) we would wait for throughout the year. The melas would make our sleepy mofussil come alive and fill it up with a kind of frenzy pregnant with a hundred opportunities where there existed none throughout the rest of the year. The melas would serve as our only windows to the big-big world that existed outside the peripheries of the mofussil. They would bring us things testing the limits of our knowledge and bewilder us. They had a bigger role to play than that though. They would make us realize the worth of growing up for they would be the only times when we would get some pocket money completely of our own. Mofussil towns are, and were always, very different from the big urban centers in that the concepts like pocket money don't exist in the mofussil. After all, the kids do not need to use public transport to go to the buildings referred to as schools. They were schools in the basic minimum sense of the word where the operative part was ‘minimum’. The kids from the mofussil would walk to the school and the ones coming from the villages peripherally attached to it would either walk/cycle to it or would be dropped by their brothers, parents or relatives. Well, I concede that motorbikes have replaced most of these cycles since those times of 20 years ago when I walked to one such school. Not one of these schools would have anything even remotely akin to something called canteen. Canteen, in fact, was a word I got familiar with only when I left my mofussil for senior secondary studies, and there would be no need for carrying any money. Coming back to the point,because we would not need any money of our own to live in the mofussil, we would not get any pocket money. That was a concept that remained completely alien to us till the melas came as saviours giving us money that was our own. I did not have any particular liking for the god, or even for the concept of the god, but then I was quite happy for the fact that he brought us melas at least twice a year. Nothing of this was comparable to the intoxicating trance that used to descend over our Kasba during the Dusehara festivals. That used to be the only time we felt proud of living where we did. The town would be full of pandals( tableaus) reconstructing the imagery of the victory of good over evil. Well, I accept that I have always had my doubts about what actually constituted good and evil but that did never stop me from living those days to the full.In the dark distant past when we did not have any cable television or computers, when facebook was almost a generation away Dusehara celebrations were our only shot at freedom to celebrate. It gave us a semblance of a night life, the only week in a year when we could afford to return home really, really late. It also gave us our best friends. The friendships had started developing over edibles bought in the melas and shared with the buddies we found ourselves really close to and it was the time for them to cement themselves into relations that would last a lifetime. Well, let me also concede that these friendships based themselves over many a things that could qualify to be called sinful, at least on the thresholds. We would roam around almost all night and attend every single devi-jagaran or ratjaga (all night singing and worshiping the goddess). We won’t do that for any religious reasons though. The ratjagas would give us our only shot at spotting the beautiful girls of our mofussil and waiting for that elusive smile that would make us fall in love with them. Our chants would be replete with elbowing each other and announcing our love for the girl we would most often not even know the name of. Those would prove to be one of the most precious moments of our lives. Singing some devotional song or chanting that ubiquitous ‘jai mata di’ we would be poking our ‘best friend’and telling him about the girl in blue suit, decades before That Girl in Yellow Boots was to come. There would be sacrifices, of course very silly ones, too. One would not take a moment to relinquish his love if the other professes it before him! Forget the fact that more often than not we would not get a chance to talk to that ‘true love’ of ours even once in a lifetime. We were happy with the god (in fact, the goddess) that one could steal a glance at her, and got a smile in return as well at times, of course as presumed by him and vehemently supported by the buddies. Forget the fact that the true love kept changing year after year. Forget the fact that nothing remained the same after we left the mofussil for higher studies. Forget the fact that we were shocked to find our ‘true loves’ having aged at a pace much higher than us, often married and with babies, when we got back for those holidays that shrank every year. Forget all this, for nothing of this takes away the celebration of the life that was so intrinsic to the festivities. 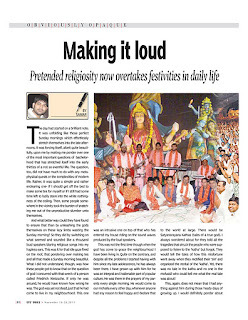 The festivities, in turn, trumped religiosity inherent to these festivals. Whether or not the ratjaga celebrated the victory of good over evil, it did celebrate the triumph of love (the possibility of love at least) against the repressive system hell bent against any assertion of individual choice. The ratjaga might not have been anything comparable to starry nights that defined the metropolitans but they did give us something to feel proud of, something to talk about to our blessed cousins growing up in cities. 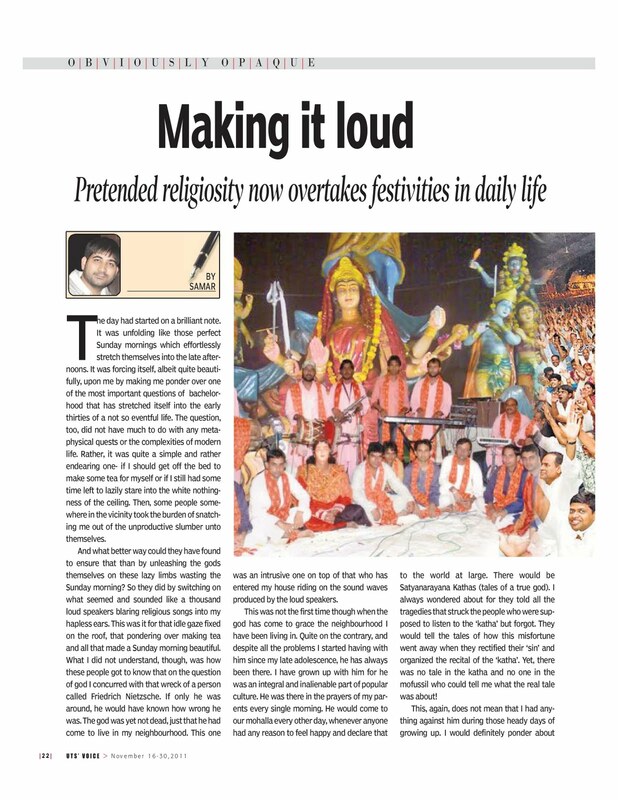 The festivals, and the festivities attached to them, celebrated something more than that. They marked the triumph of the collective while accommodating the individual. 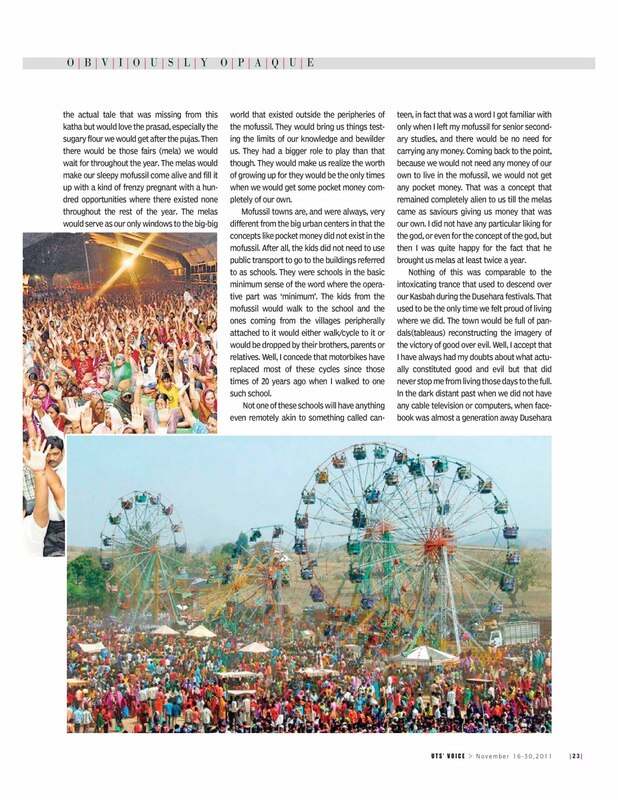 The mofussil did never have any event managers, they do not have ones even today. Everything that got organized was organized by the community often obliterating the caste and religious divides. 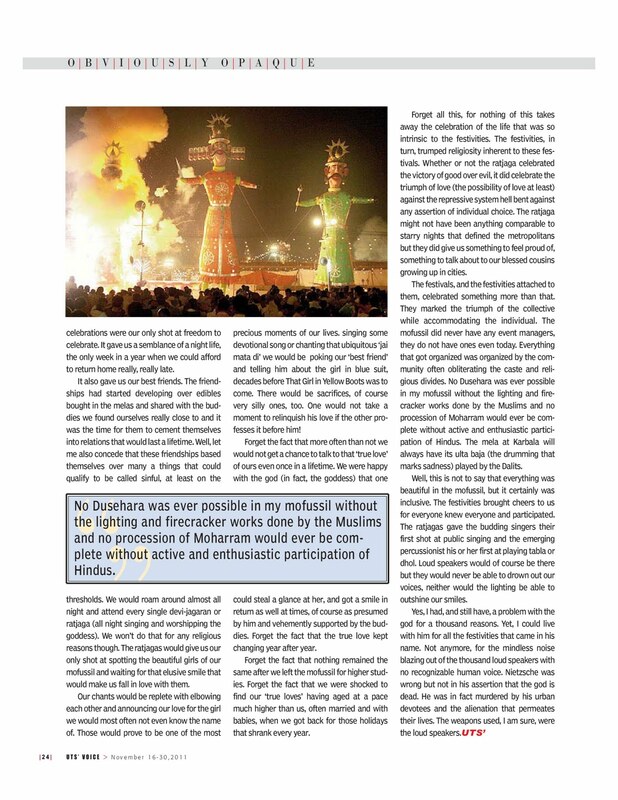 No Dusehara was ever possible in my mofussil without the lighting and firecracker works done by the Muslims and no procession of Moharram would ever be complete without active and enthusiastic participation of Hindus. 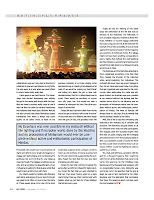 The mela at Karbala will always have its ulta baja (the drumming that marks sadness) played by the Dalits. Well, this is not to say that everything was beautiful in the mofussil, but it certainly was inclusive. The festivities brought cheers to us for everyone knew everyone and participated. The ratjagas gave the budding singers their first shot at public singing and the emerging percussionist his or her first at playing tabla or dhol. Loud speakers would of course be there but they would never be able to drown out our voices, neither would the lighting be able to outshine our smiles. Yes, I had, and still have, a problem with the god for a thousand reasons. Yet, I could live with him for all the festivities that came in his name. Not anymore, for the mindless noise blazing out of the thousand loud speakers with no recognizable human voice. Nietzsche was wrong but not in his assertion that the god is dead. He was in fact murdered by his urban devotees and the alienation that permeates their lives. The weapons used, I am sure, were the loud speakers.